Here's the DIY I promised you guys last week. I've been planning on doing this for a few weeks now but ordered my spikes for super cheap online and they took about a month to get here. I got my inspiration for these lovely shoes after falling in love with these shoes from Sheinside. However, I wasn't willing to pay $78 for them and figured I could do it myself and add my own personal touches for a fraction of the price. 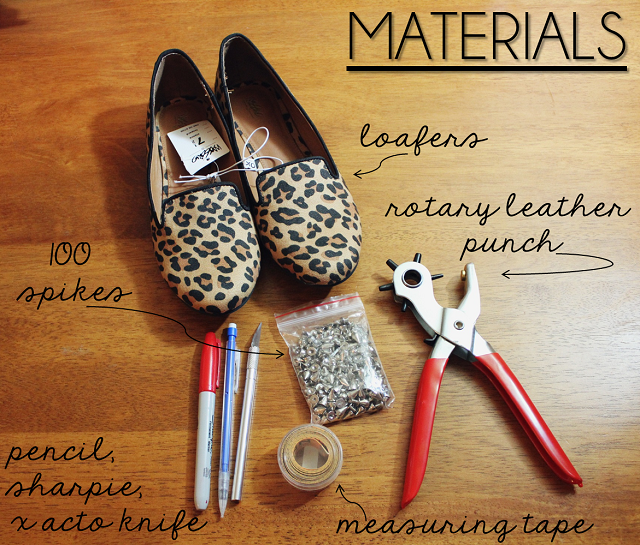 Step 1 PREPARE// Make sure you have all of the materials listed above and that your rotary leather punch is set at the right size you will be needing for this project. You can even do a test hole punch on an extra piece of fabric. Once I was positive about where I wanted to insert the spikes, I went over the pencil dot with a black sharpie. This made it easier for me to see where all the punches needed to be made. Your shoe will look sort of like this once you are done. Step 3 PUNCH// Start by punching your first hole. 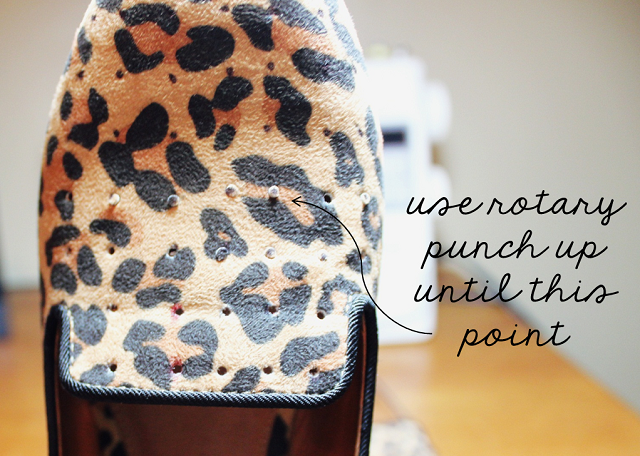 Make sure you apply enough pressure to cut through all layers of the shoe. 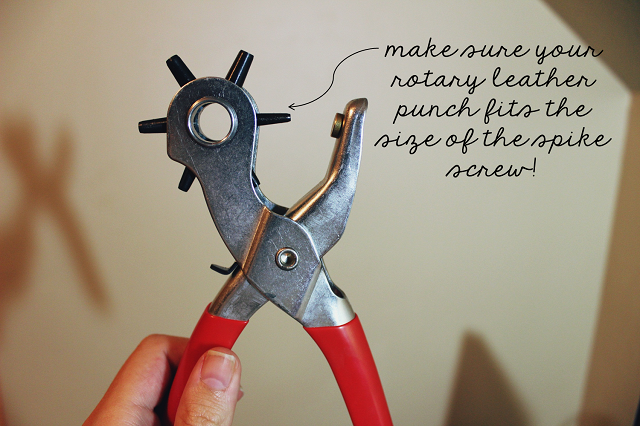 Make sure that the punch is clean and that you can get the screw through it. At this point I inserted 1 screw and spike to make sure that it was the perfect size. After doing this continue to punch until you no longer can. If you are going to go ahead and do it by hand make sure and do what I like to call "the spinning technique". If you use all of your force to try and shove the knife through the shoe you are going to cause it to rip. To prevent this from happening take the blade and gently start twirling it around where you want to make the hole until you go through the layer of the shoe. I should have taken a picture of what I mean but like I said I was watching tv while doing this part. Step 5 INSERT SCREW & SPIKE// This is the easiest and most rewarding part of the experience. After all of your hard work you slowly get to see your shoe come together! I inserted my spikes row by row so that I would reduce the chance of getting poked! Thanks for the fab tutorial! Wonderful! =) Wish we had spike packs like that in Norway. Anywhere online I can buy? wow, love how they come out! Very nice DIY! wow. this is beyond cool! beyond! Great DIY project. Think I'll be doing this instead of buying them. Awesome shoes! Love that you totally made your own- and rocked it! These are AWESOME! They're not too much either like some of the spiked & studded ones I've seen. I love the animal print too! So cute!! this is the best tutorial! love the shoes! your blog is adorable! Awesome idea...haven't ever seen studs on leopard...an it's rocking awesome! Love this idea Cecilia! 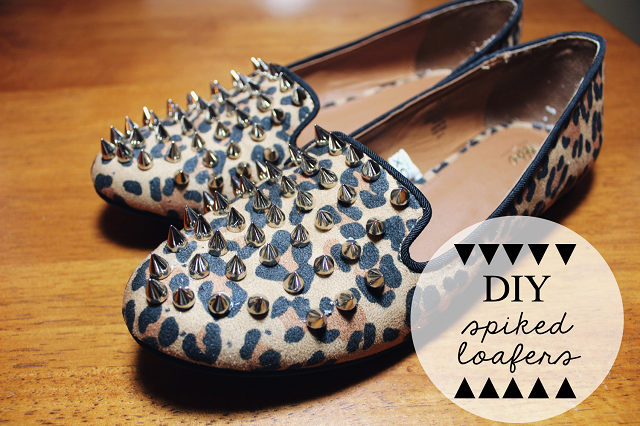 Spiked loafers are totally fabulous, yet so darn expensive! Love this - they look awesome! They look gorgeous and so on trend! I've got a vintage giveaway on my blog if you'd like a look! WHere did yo get the spikes?